This gorgeous card will bring elegant well-wishes to your loved ones this holiday season! 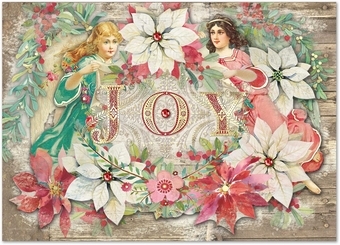 It features a pair of angels surrounded by poinsettia blossoms. "JOY" is written at the center, and the card is embellished with gold foil and gems. Inside is written, "Wishing you all the Blessings of the Season".